Thursday January 3rd, 1889 Will went and brought the new girl this morning & helped some with the work in the forenoon. Hatt came over just as we had dinner ready. Nell Swisher and Susie Tallent called in the afternoon. The four boys from Marshaltown came last night. Friday January 4th 1889 I did a little knitting today. Aunt Ellen and Libbie were here for a visit. Mr. Brown came last night - he brought me a pretty present from his mother. Weather pleasant. Saturday January 5th 1888 [sic] The work was all done so Mother went to town in the afternoon. Will was about the place all day at work. The folks were over to spend the evening and brought Mother the new dress we had bought for her birthday present. I was out doors a little while today. Sunday January 6th 1889 Charlie and Ott came in early in the forenoon and stayed some time. Mother went over to the Hatties in the afternoon and Charlie came home with her to stay till after supper. Will went back to town with him. I read a little in the afternoon and evening. Monday January 7th 1889 I did not feel so well this morning and did not get up till nearly ten oclock. The girls were over all afternoon though it snowing. I was working on my lace. Will was looking for a hand to work. 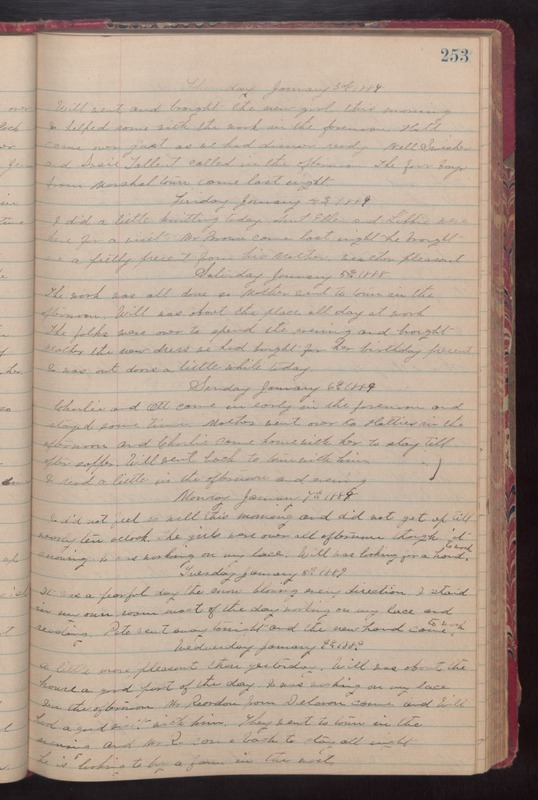 Tuesday January 8th 1889 It was a fearful day the snow blowing every direction. I staid in my own room most of the day working on my lace and reading. Pete went away tonight and the new hand came to work. Wednesday January 9th 1889 A little more pleasant than yesterday. Will was about the house a good part of the day. I was working on my lace. In the afternoon Mr Reardon from Delavan came and Will had a good visit with him. They went to town in the evening and Mr. R. came back to stay all night- he is looking to buy a farm in the west.